We knew we had a great thing with the Logan MCV. But complacency isn't our thing. 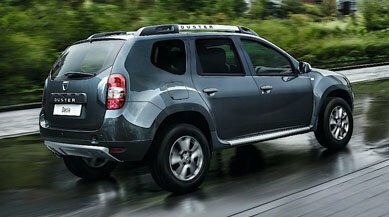 So Say hello to the newest addition to the Dacia family: the Logan MCV Stepway. What about the sturdy SUV styling? We've raised the ride height, given it a brand-new wheel design and satin chrome skid panels. This all means that the Logan MCV has never looked more adventure-ready. It's not just a pretty face, either. It's got loads of useful features like heated, electronically-adjustable door mirrors for optimum visibility. Plus, getting where you need to go is easy as pie, with rear parking sensors, an optional rear parking camera and handy Hill-Start Assist. As well as LED daytime running lights, we've added front fog lights to maintain a clear view of the road, whatever the weather throws at you. Aa you'd expect from Dacia, the engine's got great fuel economy so doesn't cost the earth to run. The dCi 90 diesel engine reaches over 72 mpg on the combined cycle. The inside of the Logan MCV Stepway has just as much going on as the outside. Like the futuristic yet surprisingly easy-to-use MediaNav Evolution. It's got a clear 7" touchscreen and top-notch navigation to get you wherever you need to be. It packs a high-quality DAB radio, USB and AUX ports to keep you charged up and entertained. It's even got Bluetooth to keep you connected on-the-go. Talk about multi-purpose! Dacia Logan MCV Stepway. Off-road spirit. Family-friendly. With Logan MCV Stepway Big space doesn't mean big running costs. The state-of-the-art TCe 90 3-cylinder turbocharged petrol engine combines peppy performance with frugal fuel effciency and CO2 emissions of just 116 g/km. Or, for long distance cruising, why not choose the dCi 90 diesel engine, with combined fuel consumption of 74.3mpg and CO2 emissions of just 99 g/km. At Dacia, our simple range of cleverly designed cars only useful technology. That's because we believe you should only pay for the things that you value, rather than those you don't. Priced from just £12,495 on-the-road, Dacia Logan MCV Stepway offers a groundbreaking combination of practicality and affordability. Take our rear parking camera for £200 for example, Or, how about luxurious leather upholstery for £500. With three simple trim levels, a range of useful options and extended warranty up to 7 years / 100,000 miles, it's easy to tailor a package to suit you. Dacia Logan MCV Stepway. Maximum Capacity. Minimal cost.